i Click 'view all' to instantly compare this ok deal with offers on other top espresso machines. Keurig K55/K-Classic Coffee Maker K-Cup Pod Single Serve is currently selling at $88.83, approximately $3.60 higher than average, giving a potential saving of $11.16 right now. With a lowest price of $69.99 and an average of $85.23 it is selling on the high end of its usual range. Price volatility is 5.05% (meaning it changes a few times a week), so the price may drop reasonably soon. Right now this product is a recommended 'ok deal'. Compare the current price, savings (in dollars & percent) and Buy Ratings for the top Espresso Machines that are closely related to Keurig K55/K-Classic Coffee Maker K-Cup Pod Single Serve. Here is how Keurig K55/K-Classic Coffee Maker K-Cup Pod Single Serve compares with other leading Espresso Machines. The Classic Keurig K-Cup Single Serve Coffee Maker, and a perennial best-seller, the Keurig K55 brews a rich, smooth, and delicious cup every time with the quality you expect from Keurig. Simple touch buttons make your brewing experience stress free, and multiple K-Cup pod brew sizes help to ensure you get your perfect cup. Whether you like your coffee strong, mild, decaf, or flavored, you can brew all of your favorites with the Keurig K55 – and with large 48oz water reservoir, you can brew 6+ cups before having to refill. Discover hundreds of K-Cup pod varieties from all of the brands you love, including Green Mountain Coffee, Starbucks, and Lipton, and enjoy coffee, tea, hot cocoa and more. Also available in a two fun colors to complement your décor, and compatible with the Keurig Classic Series My K-Cup Reusable Coffee Filter, so you can brew your own ground coffee. 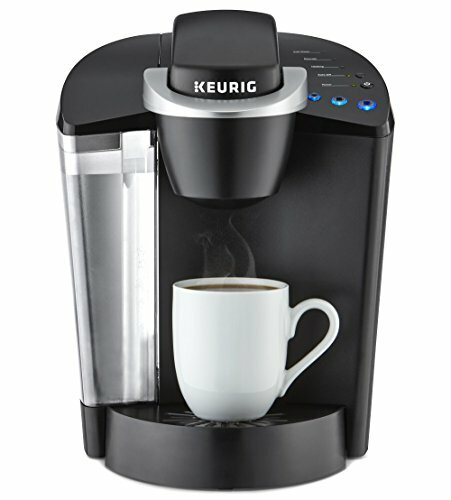 FeaturesWHAT'S IN THE BOX: The Keurig K55 K-Cup Single Serve Coffee Maker includes 4 K-Cup pods and a water filter handle + 2 water filters to help your beverages taste their best.BREWS MULTIPLE K-CUP POD SIZES: (6, 8, 10 oz.) - the most popular K-Cup pod brew sizes. Use the 6oz brew size to achieve the strongest brew.LARGE 48 oz. WATER RESERVOIR: Allows you to brew 6+ cups before having to refill, saving you time and simplifying your morning routine. The water reservoir is removable, making it easy to refill whenever you need to.DESCALING: An important part of cleaning your Keurig brewer. This process helps to remove calcium deposits, or scale, that can build up inside a coffee maker over time. Please refer to our descaling video for step by step instructions.